It’s all relative: The future of plantar pressure measurements? The Plantar Pressure Magnitude (PPM) has been frequently used by many investigators to assess gait behavior of patients with foot deformity or with risk of foot complication. However PPM is not an independent outcome since it may vary due to several independent variables including BMI and gait speed. This in particular hampers objective outcome evaluation post foot reconstruction intervention, when subject may increase his/her gait speed as a result of intervention. For example, Fig 1 illustrates PPM in a Charcot case pre and Post foot reconstruction surgery. Although the shape of plantar pressure has been modified, however the PPM was increased mainly due to increase in gait speed post operation. 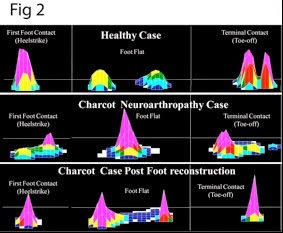 Figure 2 illustrates the spatial distribution of plantar pressure during walking in a healthy case, Charcot pre operation and post operation. This figure illustrates that shape of distribution is changed due to operation rather than maximum of PPM. Recently via collaboration between Chicago’s Center for Lower Extremity Ambulatory Research (CLEAR) and the University of Arizona’s Southern Arizona Limb Salvage Alliance (SALSA) teams, we explored the pattern of plantar pressure pre and post operation in Charcot patients with foot deformity as well as in healthy subjects. Interestingly we found out that health subjects have always a normal shape for statistical distribution of plantar pressure (see Fig 3), while in Charcot patients with foot joint deformity this distribution is abnormal but becomes normal post foot reconstruction. Our team suggested a simple score named RF (regression factor) for quantifying this phenomenon. RF values may range from negative 1 to positive 1 and as the value increases positively so does the similarity between the actual and normalized pressure distributions. We have demonstrated that the RF value is always negative in Charcot patient and is always positive for healthy subjects as well as Charcot gait following successful foot reconstruction. Furthermore, we have demonstrated that this novel score is independent of gait speed, which may offer a universal score for quantification of gait abnormality due to any foot deformity.